This week those of us in the western hemisphere will have the chance to observe a lunar eclipse. It will happen in the evening/morning of April 14/15, reaching peak darkness at about 3 a.m. EDT (0600 GMT). Depending on the darkness of your sky, the Moon may be invisible to the naked eye, or it may appear as a dark, blood moon. A lunar eclipse occurs when the Moon passes through the shadow of the Earth. For this reason, lunar eclipses occur when the Moon is in its full phase. Given that the Moon orbits the Earth, you might wonder why there isn’t a lunar eclipse every month. If the orbit of the Moon were exactly in line with the orbit of the Sun, then that is exactly what would happen. But the Moon’s orbit is tilted about five degrees relative to the orbit of Earth, and this means that the Moon is often slightly above or below the Earth’s shadow when it passes through its full phase. So most months there is no lunar eclipse. For the Moon to be lined up in the right way, it has to be located near the plane of the Earth’s orbit when it passes behind the Earth, and this only happens twice a year, about 6 months apart. This is why there are “eclipse seasons” in Spring and Fall. There are at least two lunar eclipses each year, but there can be as many as 5. Not all lunar eclipses are alike. As seen in the image below, since the Sun is larger than the Earth, there are regions where only part of the Sun is blocked by the Earth, and the resulting shadow is called the penumbra. For a much smaller region where the Sun is completely blocked by the Earth, the shadow is called the umbra. The type of eclipse that occurs depends on whether the Moon passes through umbra or penumbra. 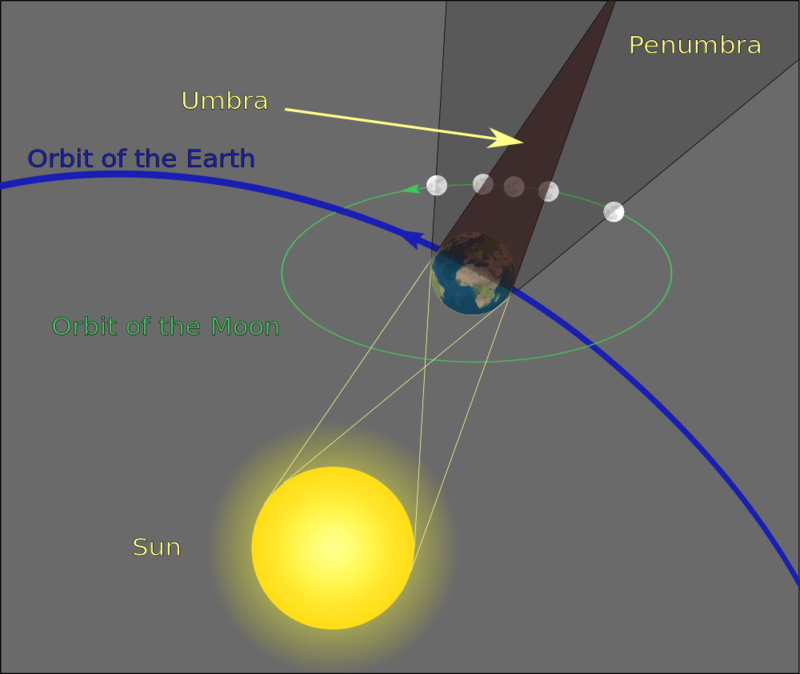 If the Moon just passes through penumbra, then what occurs is a partial lunar eclipse. In this case only part of the moon will appear dimmed. If the Moon passes through the umbra, then you get a total lunar eclipse. It is while passing through the umbra that you can observe a blood Moon. The reason the Moon can appear red rather than completely dark is that some sunlight is refracted by the Earth’s atmosphere. If you were standing on the Moon during a lunar eclipse you would see the Earth surrounded by a ring of sunset. 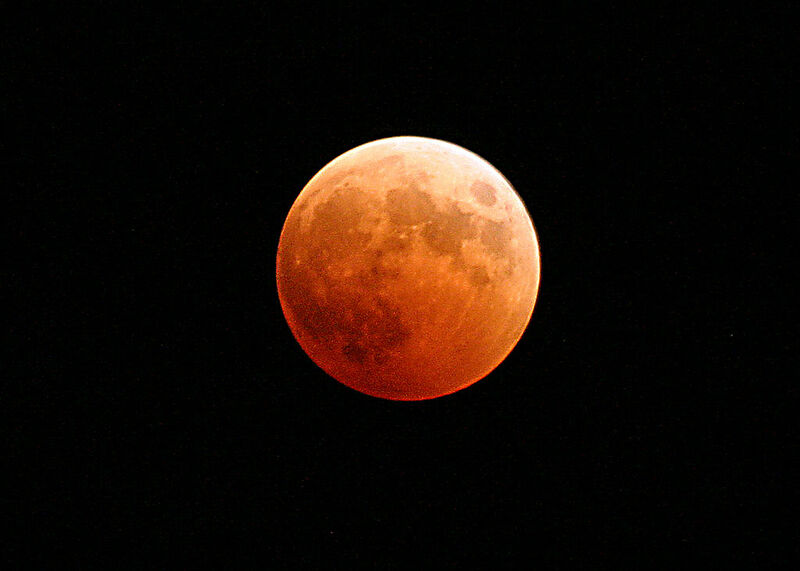 This particular lunar eclipse is a total one, and it marks the first of four consecutive total lunar eclipses. One for each eclipse season every six months. So if you miss this one, you’ll have another three chances over the next year and a half. After that, total lunar eclipses will be less common for a while. So brace yourselves, the eclipses are coming.